Just a point for clarification, you don’t actually need to have received a Carer’s Allowance payment on the 16th April precisely, in case anyone is concerned. Payment dates vary, for example I always get my payment near the beginning of the month. It’s a bit confusing when they say that you need to be getting CA on the 16th April but what they mean is that you have to be entitled to it on 16th April to be paid the supplement. Hi, I live in Midlothian and yet to receive any letter or payment. as long as you live in Scotland and you get a carers allowance payment on the qualifying date 16th April , you will get a payment of the carers premium . the person you care for does not have to live in Scotland. but if you did not get a carers allowance payment on the 16th April you will NOT get a payment of carers premium . Thanks James your probably right I'm sure I will receive something soon. Hey Karen I'm Fife and I haven't had either beginning to think I'm not worthy. It really is getting me down. 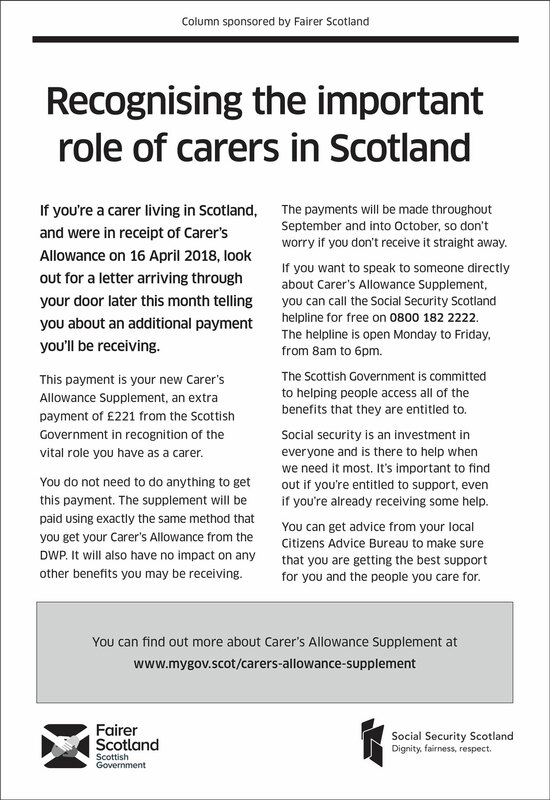 Has anyone had there first payment of £221 for carers allowance supplement in Scotland? Letters have been getting sent out from 10th September but I have not had anything yet? I received my letter yesterday. My payment was authorised on the 18th September and I was told I'd receive it within two weeks. When I phoned up to ask earlier, I was told it was a geographical rollout and that each region would be dealt with separately. And what is a geographical rollout it should be pain en block to everyone who qualifies. Phone number provided in my posting above.